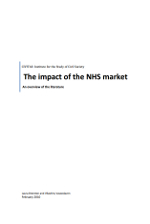 The NHS has operated on the basis of a market since 2002, with a split between purchasers and providers of health care. In the first comprehensive review of the evidence thus far, the authors show market forces have contributed to: improved access for patients; reduced waiting times and increased efficiency; and improved financial management in providers. However, benefits are not widespread. The NHS appears to be in the unfortunate position of taking on the extra costs of competition without realising the benefits.